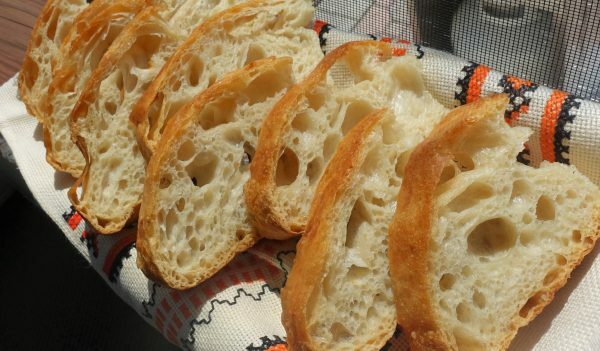 If you are craving some crusty fresh bread, you will be surprised how easy it is to bake one of your own. This recipe is for one delicious loaf of bread, from just 3 cups of flour, 1 tsp yeast, salt, and water. No kneading, no fuss, just combine all the ingredients in a bowl, forget about it for 18 hours…or even longer…I worked with mine after 20 hours (time ran away from me too quickly), and look how beautifully it turned out. Isn’t it yummy looking…all you need is some sweet creamy butter, and your bread craving is satisfied. This recipe yields 1 medium loaf of bread. In a large bowl mix all ingredients, except the butter. This will form a runny and sticky batter. Cover the bowl with plastic wrap and place it in a warm, non drafty place, for 18+ hours. Generously flour your work area, and scoop the batter onto it. Sprinkle more flour over the top of the batter, and pat it down with floured hands , to form a rectangle. Then fold each side to the middle of the dough (like an envelope), pat it down again, and repeat the folding again. Use the same large bowl, and either oil the bottom and sides, or sprinkle generously with flour, line with a oversized piece of parchment paper and place your dough on it. Cover with a kitchen towel, and let it rise for 2 hours. During the last 30 minutes, turn on the oven to 425 degrees F to preheat it. Also place your covered cast iron pot in the oven to heat it up. After 30 minutes, keep the oven on, take out the hot pot (be extremely careful...very hot), uncover and drop the dough into it. Bake it covered for 30 minutes. Uncover, and bake it for additional 15 minutes. Remove it from the oven, place the pot on a cooling rack, smother cold butter stick all over the top of the loaf, to make the crust a little softer and buttery tasting. After about 10 minutes, remove the bread from the pot, butter the bottom, and cool completely on a cooling rack. Once fully cooled, slice it, and enjoy it with your sweet butter, cream cheese, or any way you like.